(Nanowerk News) A small fluorescent molecule has shed new light on knots of DNA thought to play a role in regulating how genes are switched on and off. DNA is typically arranged in a double helix, where two strands are intertwined like a coiled ladder, but previous research has shown the existence of unusual DNA structures called quadruplexes, where four strands are arranged in the form of little knots. Now researchers at Imperial College London led by Dr Marina Kuimova and Professor Ramon Vilar are unravelling the mysteries of these four-stranded DNA structures. They have created a fluorescent molecule that can reveal the presence of these structures in living cells ("The interactions between a small molecule and G-quadruplexes are visualized by fluorescence lifetime imaging microscopy"). 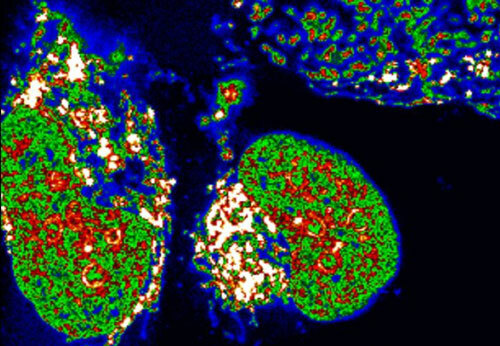 The team used the glowing molecule to target quadruplex DNA inside human bone cancer cells grown in the laboratory. Together with colleagues from Kings College London, they studied the interactions between the two in real time, using powerful microscopes. 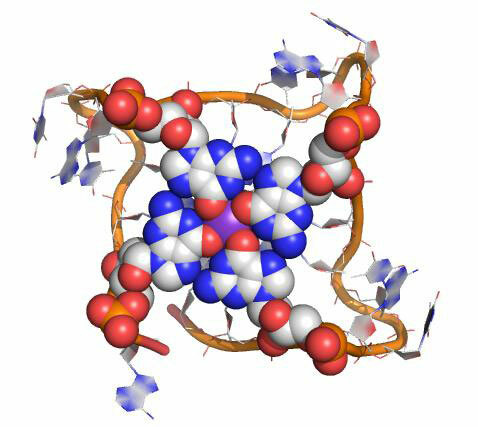 Quadruplexes can form when a strand of DNA rich in guanines - one of the four building blocks in DNA - folds over onto itself. Several distinct quadruplex structures have been found in the human genome but their exact role remains unclear. Recent studies have shown they are particularly prevalent in regions nearby oncogenes - genes that have the potential to cause cancer. "There is mounting evidence that quadruplexes are involved in switching genes on and off because of where they are usually positioned within the genome," says Professor Vilar, from Imperial's Department of Chemistry. "If this can be proved, it would make quadruplexes an extremely important target for treating diseases such as cancer. But to understand what role they play, we need to be able to study them in living cells. Our new fluorescent molecule allows us to do this by directly monitoring the behaviour of quadruplexes inside living cells in real time." The team designed the fluorescent molecule to glow more intensely when attached to DNA. Using powerful microscopes they discovered that they could distinguish between the molecules binding to the more common double helical DNA and quadruplex DNA because it glowed for much longer when bound to quadruplexes. The researchers were also able to visualise the fluorescent molecule being displaced from quadruplex DNA by another molecule known to be a very good quadruplex binder. This suggests that the Imperial molecule could be used to hunt for new compounds that can bind to quadruplexes. Co-author Arun Shivalingam, who worked on the study during his PhD at Imperial, says: "Until now, to image quadruplexes in cells researchers have had to hold the cells in place using chemical fixation. However, this kills them and brings into question whether the molecule really interacts with quadruplexes in a dynamic environment." Professor Vilar adds: "We've shown that our molecule could be potentially used to verify in live cells and in real time whether potential quadruplex DNA binders are hitting their target. This could be a game changer to accelerate research into these DNA structures."